You are here Home » Blog » What Does AI (Artificial Intelligence) Software Have to Do with Managed Print Services? SmartPrint has been offering our clients simple, scalable AI software solutions supporting digital transformation for a couple of years. The demand to transform paper-based manual processes continues to increase in finance, legal, healthcare, manufacturing, insurance, retail, and other sectors. Implementing easy to use, scalable business process automation software solutions are becoming much more mainstream. It really doesn’t need to be complex. Digital transformation results in increased efficiency, which can translate to a competitive advantage for your organization. Automating document management storage – we can implement AI software to automatically distinguish between thousands of document types and formats to allow for high-speed capture, classification, indexing, recognition, data entry and validation on almost every type of document. When we overlay AI and integrate to a document management system and securely store the content in an organized manner your content and intellectual property are safe and secure. The benefit? Your organization's documents, intellectual property, assets and client data are now in one secure place, categorized and can be searchable. No more lost content. Accounts payable – this can be very simple to deploy and extremely powerful for processing invoices. We don’t need to set up forms or any new applications. We can easily enable you to scan invoices, verify the data and the system completes the work for you. No manual error-prone key entry. With machine learning, the process can be fully automated with exception based verification when required. The benefit? Improved efficiency and accuracy. We have implemented very simple yet powerful document management systems as secure, searchable repositories for business content. When you have the repository set you can integrate and use the AI software to process digital document workflows from direct digital inputs or from processing scans to the AI software. The AI software can take the documents and automate the processing of a number of different possible processes for your lines of business. How does this all come together? Your office printing devices are the on-ramps and off-ramps of your organizations content. Your Managed Print Services experts can be the integrator that makes AI software work with your document management system, ERP and financial systems, and more. With the seamless integration of software with the right print devices, you can improve the workflow for your organization. On another very important note, given that your content can be sensitive client information, intellectual property, critical business information etc., ensuring that your print devices are secure is extremely important. A lot of sensitive data is flowing through the print devices. Also, scanning capabilities and open architecture to support simple integrations are important. 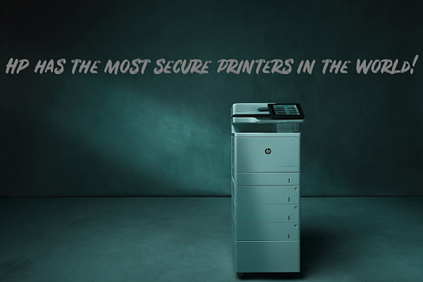 We recommend HP enterprise print devices because of their superior security and scan workflow capabilities with their patented Flow MFP and scanning devices.